An excess of carbon dioxide (CO2) in the Earth’s atmosphere is warming the planet and increasing the severity and intensity of extreme weather events. Because the atmosphere can only absorb so much of this greenhouse gas, excess CO2 is dissolving into our oceans, causing them to acidify. Ocean acidification not only harms marine life, it puts food webs at risk. While this is a grim state of affairs, there is hope, and it is right under our feet in the soil. In fact, soil is the largest “sink”—or area of storage—where additional carbon would actually be extremely beneficial. 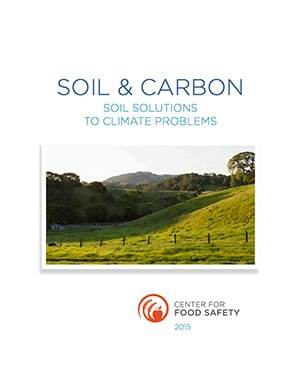 Currently our cultivated soils globally have lost 50-70 percent of their original carbon content. This means we have a tremendous opportunity to put carbon back into the soil where it creates positive feedback loops, making healthy soil a systemic solution to multiple problems including food and water security. Not only is rebuilding soil carbon entirely possible, unlike drastic climate mitigation measures like geoengineering, it is without risk.